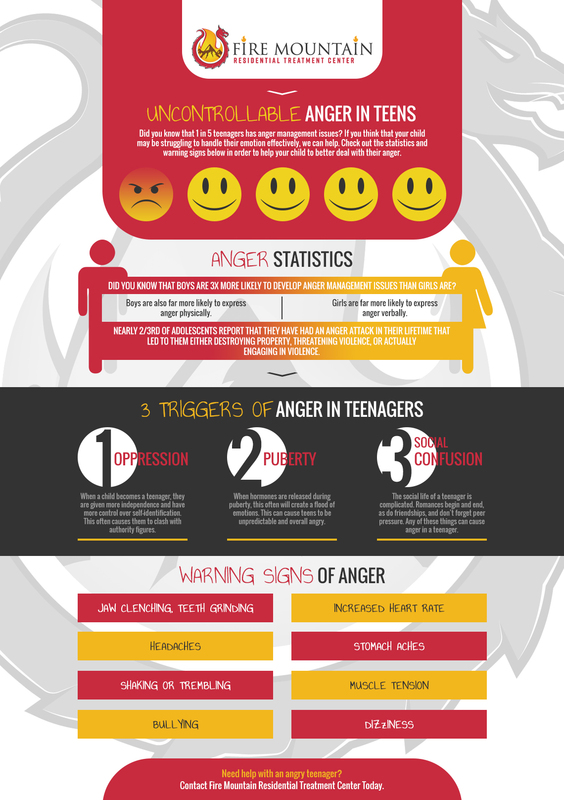 Teen Counseling Colorado: Does Your Teenager Have An Anger Problem? We hear from parents who have issues with their children all the time at Fire Mountain. These issues range from drug addiction to depression and everything in between. One of the most common issues we hear about, however, is children and teens who seem to be angry all the time. They are angry at their parents, they are angry at their siblings, at their teachers and authority in general. The parents of these adolescents often want to know, is this behavior normal? Should they be worried? Seeing as how we work with children with anger issues often, we feel as though we may be able to offer some insight on the situation if it is one that is occurring in your home. Below you can uncover the answers to some of the questions you may have if you are living in a home with a seemingly aggressive kid. As many parents know, it’s extremely difficult to deal with a child who has anger problems. In response to this type of behavior, parents seem to have several different ways of coping. One of the most common and easiest routes to take is to simply give up. Other methods of coping include punishing their child or overreacting by yelling, screaming or threatening. Truthfully, none of these responses is going to render the desired result as none of these actions will motivate your kid to take responsibility for his/her hostility. Think about it, how does your child deal with hostility once he is experiencing it? Does he even acknowledge that his actions are inappropriate or an overreaction? If not, this is going to be the important first step to solving the problem. Think about it. How can anyone solve any problem on Earth if they do not know what it is? Most children who act this way do so because of the way they think. They have developed a way of thinking that causes them to think of themselves as a victim at all times. This distorted way of thinking leads them to believe that many things about their life aren’t fair, and they deserve for them to be fair. They think their parents have placed too much pressure on them, they think their teachers and administrators don’t know anything, they think the world is out to get them. This way of looking at the world is extremely dangerous in the long run and is known as a “thinking error.” When a child has a thinking error, it makes sense that they would want to push you away at every turn. After all, you are the enemy. This allows them to avoid all responsibility and self-reflection that could challenge that idea. In fact, this is why you often experience overreactions by children with anger issues. The moment that they face any challenge or criticism, they immediately feel as though they are being ganged up on. They then either attack or shut down entirely without fail. We hear from many parents that they are scared to ask their child anything at all for fear of an outburst occurring. What has to be understood is that an outburst that occurs after you ask your kid to clean their room or do their homework is occurring because your child wants to keep you on your toes at every turn. This allows them to keep you at a safe distance, a distance at which they do not feel vulnerable. Most of the time this will result in the parent simply disengaging. They don’t want to cause an argument, they don’t want to experience an outburst and therefore, communication ends and the relationship between the parent and their child suffers. Sometimes the hostility in the home leads to parents simply giving up entirely. They don’t challenge their child anymore, they don’t try to set any expectations, they simply stop showing that they care. It is easy to understand why this might happen because the child truly does not show that they are receptive to anything their parents say or do. In behavioral therapy, this is known as ambivalence. What ambivalence comes down to is the concept of love and hate and many teens are ambivalent to their parents. It’s not that they don’t love you. They do love you, but they also hate you. They love you when you are nice to them or you are giving them something, but the moment you pose a challenge, they hate you. The point is, it doesn’t matter if they love you or hate you, but it does matter that they respect you. Much of the behavior of angry teens is learned. If you set a proper example, if you do not allow for your child to call all of the shots, if you carry yourself in a way that warrants respect, you may see a change in the behavior. If you have played all of your cards and you are still not seeing a change in the behavior of your child, it may be time to try something a little more drastic. At Fire Mountain Residential Treatment Center, we have a lot of experience dealing with angry teens. We offering counseling and much more in order to help adolescents like this to understand how they can adjust their behavior and why their reactions are often not the way someone else would respond. If you are interested in learning more about our treatment center, feel free to call us today and ask any questions you may have. We would be happy to help you and your child.